Druids with cuddly, non-evil skeletal animals?! YEAH! This archetype clocks in at 6 pages, 1 page front cover, 1 page editorial, 1 page SRD, leaving us with 3 pages of content, so let’s take a look, shall we? The ossuarite druid receives diminished spellcastng and has the usual alignment restrictions that apply to druids and their spellcasting canceled out -all the alignments are available. 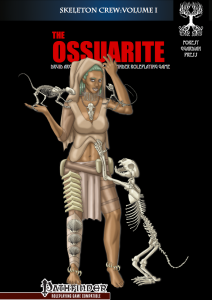 As you can imagine in the face of diminished spellcasting, the ossuarite does receive something rather unique – a skeletal animal companion. (Here a nitpick that won’t influence the final rating -the companion receives the skeleton-template, not the skeletal template…) – and thankfully DR is postponed for the immunity-studded, intelligence and skill retaining cute skeletal animal until 5th level. The ossuarite also receives 3+wis mod times detect undead instead of wild empathy. At 3rd level, the companion damages all foolish enough to attack it with unarmed or natural attacks with untyped damage – thankfully, this aura can be lowered and raised. In a damn cool twist, the ossuarite’s wild shape allows the character to turn into a skeletal aspect of herself, which, while not truly undead, is susceptible to positive energy. Better yet, the skeletal aspect increases in power every even level – including claws, channel resistance, better attributes etc. and finally, as a capstone, we receive an undead apotheosis that allows her to also shapechange into skeletal animal forms! A scaling array of specific immunities (e.g. to ghoul’s paralysis), better saves versus energy drain etc. also helps the archetype. We also receive two new feats – the Bonecaller-feat allows you to add the new graveborn template (CR +0/+1 (if creature has HD 5+) to creatures summoned via nature’s ally-spells and the second feat allows you to improve channel resistance. Editing and formatting are top-notch, I didn’t notice any glitches. Layout adheres to a beautiful 2-column full-color standard and the pdf comes with copious full-color original pieces of artworks. The pdf comes fully bookmarked for your convenience and with a second, more printer-friendly version – kudos! Morgan Boehringer’s Forest Guardian Press offers top-notch production values in this supplement – the talented Mr. Boehringer plus Will McCardell and Jim Wettstein equals quality – the ossuarite is awesome in all the right ways – iconic, balanced, smart. And then there’s the thing that I just *love* the idea of this book: Have cute, intelligent skeletal animals prancing around you? Yes, please! Perhaps it’s just the macabre goth in me, perhaps it’s me still not over the mortality of my childhood pets. But as a kid, I often fantasized how awesome skeletal animals would be. Not slobbering, mindless undead, but proper animals. This pdf allows me to indulge in that fantasy and I love it to death for it. My final verdict, in face of great crunch, awesome production values and the great concept, will be 5 stars + seal of approval. If the idea only marginally interests you, get this! You can get this damn cool archetype here on OBS and here on d20pfsrd.com’s shop!